At its full council meeting on 20 September 2018, the town council was pleased to welcome George Daniel, vice-chair of Hayle Twinning Association. Mr Daniel presented a gift from the town council of Pordic to Mayor of Hayle, Councillor Clive Polkinghorne, on behalf of Maurice Trathen, chair of the association, who had been unable to attend. 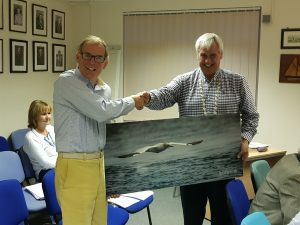 The town council has yet to decide on a suitable location to hang the gift, which is an image of a seabird in flight.